We have known that the Summerset Isle was in some form of development for a while, ZOS even originally planned it to be a zone at launch, as shown by early quest dialogue, which was uncovered by Lady Nerevar over on The Imperial Library. However, it was only recently that we have started to get hard hints towards Summerset Isle being our next Chapter location. In Morrowind, we learn that Veya (Naryu's "daughter") is sent to the Summerset Isles if you choose not to kill her, where she will likely fulfil her part in the Sweetroll Prophecy from the Dark Brotherhood DLC. We are also outright told by The Grand Prognosticator at the end of the Clockwork City quest Cogs of Fate that "Summerset is the sequence of the words". Additionally, Sotha Sil tells Divayth Fyr to warn the Psijics in Summerset of the impending threat, with Nocturnal telling us that the Daedric Triad loom over Summerset. And finally, there is of course our data mine, which gives us a first look of actual Summerset assets in the files. As if what has been hinted in the game's story already is not enough, our findings strongly suggest that ZOS indeed does intend to send us to the Summerset Isle in the next chapter, but ultimately, it is only they who can confirm it themselves. Before we get into what we found, though, allow us to delve into the lore of the Summerset Isle, and give you some context and an idea of what to expect. Warning: This post might turn out to be a long one! Vanus Galerion: "Yes, the Altmer have a few peculiar notions. But as luck would have it, I heard that Queen Ayrenn has just issued a decree to open Summerset to immigrants and visitors. That's the perfect excuse for you to investigate the island." The Summerset Isles, at this time, is known to have banned necromancy. Telenger the Artificer said this regarding the controversial school of magic and its forbidden nature in the Summerset Isles during the 2E: "I cannot in good conscience condone such experiments, which in the Summerset Isles would be rightfully banned as darkest necromancy. I advise you to turn the fire in your heart to other, brighter pursuits.". If you have read the previous data mining post of this series about the Sload, then you will know that the people of the Summerset Isle have a very antagonistic relationship with the necromantic, slimey occupants of Thras. The people of Summerset also have an antagonistic relationship with their envious cousins, the Maormer, who believe themselves to be the rightful owners of the Isles. They have both been known to invade Summerset in the past, and according to Lady Nerevar's data mine, both the Sload and the Maormer seem to be willing enough to work together in order to achieve their ulterior motives. It is likely that we will be seeing these two foes make a return, as according to the Pocket Guide to the Empire, 3rd Edition: "The chronicler can scarcely find a year throughout the First and Second Eras when the Maormer did not ravage the coastlines of the Altmer." and mentions how the Sload made "repeated attempts to take the islands". The Altmer and Aldmer (the ancestors of the Altmer and early settlers of the Summerset Isle) were also known to enslave the native goblins on the Isle, forcing them into manual labour, often completing tasks that the Elves saw as below themselves and mundane. We have actually seen this in action with the enslaved goblins in Toothmaul Gully, who eventually go on to escape from captivity and form their own tribe under Chief Koth. Furthermore, we may see some famous faces from the lore make an appearance when we visit the Isle for ourselves, such as Nuulion, who was a master smith that worked on the Isle from the fifth to the seventh centuries in the 2E. He was known to hold the secrets of crafting Elven armour before it was revealed to Tamriel by Ulvul Llaren, an escaped slave, done out of revenge of Nuulion's maltreatment. While many of us know of Summerset as the home of the Altmer, there still isn't a great amount of information known about it compared to other islands in The Elder Scrolls series, aside from descriptions of those lucky enough to venture to the Isle itself. So let's look at the locations that we should expect to see when the Soulless One makes their way to the heart of the Aldmeri Dominion. The stunning capital of the Summerset Isles, on the western shore of the main island. Eyewitness reports on what the city looks like often vary. Some reports describe it as "made from glass or insect wings", while others describe it as straight and glimmering with "a hypnotic swirl of ramparts and impossibly high towers". Either way, it sounds like a city of great grandeur. Alinor is home to many interesting locales the player may want to visit, such as the city's Temple of Auri-El, which is said to have "bulletins nailed on the temple door, community news, sermons, that sort of thing". This sounds like the perfect place to pick up a daily quest or two. The next interesting locale in Alinor is the Alinor Orrery, which according to Lady Nerevar's data mine on The Imperial Library, "takes up a part of the sky of Alinor. By syncing the model planets with their divine counterparts, the Altmer draw magicka from the heavens.". The Orrery then "draws magicka from the sky and delivers it across the Varlines to Summerset. To do this the model planets must sync up with the celestial spheres.". According to this data mine, the Varlines are "magica conduits that stretch through the region. The Altmer use Varla Lenses to siphon magica from them for defense and other purposes.". These Varlines then come under attack, and it is the Soulless One's task to protect Alinor from the Maormer and the Sload, who are trying to disrupt the Varlines by inserting a rogue planet into the Orrery; "When the Maormer attacked, they threw the planet Auri-el from the sky and replaced it with Orgnavar, a necromantic totem planet created with the assistance of the Sload.". A famous face we may see here is Camilonwe of Alinor, the author of the book Liminal Bridges. She lives in Alinor as of ESO's timeline, and knows Vanus Galerion enough to recommend his works to the interested reader. Her own works are on travelling between Mundus and Oblivion, which are of particular interest considering that it looks like we will be entering the Spiral Skein in the upcoming Chapter's prologue quest, and possibly further into the Spiral Skein if it manifests itself as a future DLC. Cloudrest is a city in the north-central area of the Summerset Isle, built atop the mountain of Eton Nir. It has an odd mixture of architectural styles, with buildings "like strangler vines, built on top of older structures". The oldest and most isolated of the ruins are made of coral, which suggests the original occupation of the Sload. There is also a Baron's Maze in the city, which consists of many confusing passages. The Crystal Tower is an ancient structure and of great symbolic importance to the Altmer, comparable to how important the White-Gold Tower was to the Ayleids. The tower itself is said to be composed of white interiors with radiating light, and glittering walls containing the graves of the early Aldmeri settlers who travelled to the Summerset Isles in the mass exodus from their original home of Aldmeris. Additionally, in The Elder Scrolls: Arena, it is said that the Crystal Tower "dominates the area, rising like an accusatory finger pointing at the sky above", with parts of the tower itself seemingly found in other planes of existence. The top of the Crystal Tower was said to be reserved for interring the dead. Moreover, the tower is supposedly so tall, the Dragon's Teeth Mountains of mainland Tamriel can be seen from the top parapet of the tower. For perspective, these are the same mountains where Fang Lair, a dungeon from the upcoming Dragon Bones DLC, is located! The tower serves as a lasting symbol, honouring those who founded the Summerset civilisation. Notably, it is home to a cache of artistic and cultural treasures, including sculptures and tapestries that depicted creatures which once roamed the land of the Summerset Isle, before being exterminated. Amongst the depictions of creatures are the Welwa, who we have seen in ESO before—domesticated by the Iron Orcs in Craglorn. The Crystal Tower is also famed for its animal pens, which house a variety of rare creatures from all over Tamriel. Legend has it that translations of tapestries inside of the Crystal Tower describe the "beautiful yet alien" land of Aldmeris, the original home of the Elves. The texts set out how "The land is shown as an endless city built upon itself over and over again until no trace of nature remained". This could be something we get to see for ourselves inside the Crystal Tower! The Crystal Tower also has a reputation for being one of the leading places in Tamriel that an aspiring mage can visit to study magic. Some describe it as the "crux of magic in the world", while others, such as the Arch-Mage Hannibal Traven in the Third Era, claim that "Before the Arcane University was founded in the second era, Crystal Tower on Summerset Isle was the source of all magical learning". Either way, the tower certainly has a grand mystical presence amongst the arcane users of Tamriel. Finally, the Crystal Tower seems to have numerous dungeons deep underneath. One instance was made known to us by the Eyes of the Queen, who stated before that there are "dungeons beneath the Crystal Tower", with another instance of subterranean complexes being the Sapiarchs' Labyrinth. This Labyrinth is where the heir to the throne of Alinor would study Altmeri Regal Praxis and Ceremoniarchy in order to prepare themself for the task of ruling. 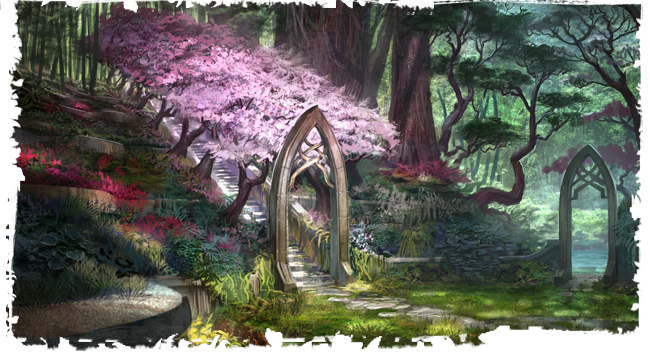 Ayrenn spent time studying here before her disappearance, and then Prince Naemon underwent the study for some time himself before Ayrenn made her surprising return to the Isles, not long after the death of their father. So, there are at least two notable examples beneath the tower which show potential for a new Group Dungeon or Trial. A city on the southeastern shore of the Summerset Isle. In Lady Nerevar's data mine on The Imperial Library, it is said to be the home of the Scintillants, who are expert smiths. The tallest mountain in the Summerset Isles, and the site of some of the Isles' most impressive architecture. It is located in the north-central area of the Summerset Isle, acting as a foundation for the city of Cloudrest, which sits atop the mountain. A port city on the northwestern shore of Summerset Isle. Known to have engaged in major internal conflicts with Alinor, the capital city, throughout the 1E and 2E. In 1E470, a group of Elves living in the city found the Flask of Lillandril. While not Elven by craft, it is a powerful artifact that can absorb magic, being used by those who discovered it to perform favours for the Barons of Summerset Isle; keeping the magical powers of the Bosmer under control. However, it was lost at sea when a boat transporting it was shipwrecked on a coral reef near Stros M'kai. When Cyrus later unearthed the artifact in The Elder Scrolls Adventures: Redguard, it was rumoured that Clavicus Vile acquired the Flask, so we know Lillandril has links to one of the Daedric Triad in that regard. Lilandril is also home to a branch of the Mages Guild, which is of particular interest, as they draw their power from a potent magical diamond. It was powerful enough to locate the Crystal Tower during the Imperial Simulacrum, which was hidden from view during Jagar Tharn's conquest of Tamriel. A village at the far-eastern end of the Summerset Isle. This is where Vanus began his journey to Artaeum with a soothsayer named Heliand. Once he arrived, the Magister of the Isle, Iachesis, recognised the intelligence and sophistication of Vanus. Iachesis took Vanus under his wing, where he trained his body and mind, eventually going on to be the first Archmagister of the Mages Guild. A city in the eastern-central area of Summerset Isle, sometimes described as the "city of lights", as seen in an Arena document. We may see Aicantar of Shimmerene make an appearance either here or in the Crystal Tower. Author of the book Before The Ages of Man, he is also the Sapiarch of Indoctrination during ESO's timeline. Birthplace of Vanus Galerion, a town halfway across the Summerset Isle from Alinor. Vanus's father was executed by hanging here for teaching his son how to read (forbidden at the time). A city in the south-southwestern area of the Summerset Isle. According to Lady Nerevar's data mine on The Imperial Library, it was originally planned for Sunhold to be taken over by the Maormer, who bombarded the Isle with diseased corpses: "Day and night the Maormer bombard our Blessed Isle with their mundane machinery. For munitions, they use diseased corpses - a tactic most foul! I ask you to infiltrate Sunhold, destroy the Siege Engines, and slay the Engineers who maintain them." We have found multiple new Summerset related assets, with the prefix 'SUM' inside various folders called 'Summerset'. Inside these, we have found numerous assets which strongly hint to Summerset Isle being the next zone we see in ESO. This appears to be the model file for what looks to be a Daedric Titan, but of a new skeletal variant. This will probably be used as a Group Boss, an enemy involved with a quest, a Group Dungeon boss, or even a Trial boss. This appears to be the mesh file for what looks like a collection of Summerset spruce tree leaves. The file name states that this is a Summerset dungeon set. It looks like it is intended to be used underground, as suggested by the file directory, presumably in a circular position due to the wedge shape of the ceiling. There is even an Aldmeri Dominion symbol on the inside too. A Summerset ruined colonnade asset. This is a ruined stair dungeon set, presumably used in the same Summerset dungeons as the previous assets, based on the style shown. 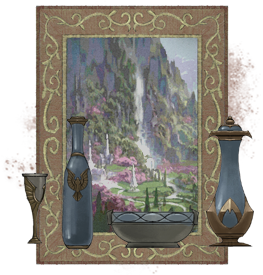 This shows a Summerset Peryite asset. Not to be confused with the Peryite statues that are featured at the end of the Scalecaller Peak dungeon; as the middle statue has its head pointed down, and the two statues on either side have their claws behind their tail, whereas this asset has the claws in front. Interestingly enough, there is a mention of a shrine to Peryite that is located on the Summerset Isle in Kyne's Challenge, which depicts Altmer fighting "slug-like creatures", presumably the Sload. This is an asset for a Maormer storm, and it is massive! We do know though that there is a "wall of impenetrable mists" around the continent of Pyandonea, home to the Maormer. Could this be a background asset we see in the distance from the shores of the Summerset Isle, or will we see it as part of a Maormer invasion on the Isle itself? For comparison, the storm completely engulfs this model of the Ceporah Tower, which you might already know is huge in itself from our data mining post that we published earlier this month. Since many expect a new system/class/skill-line to accompany the upcoming Chapter, we thought to revisit the prospect of a fan favourite—Spellcrafting. First teased back in QuakeCon 2014, the system showed a lot of promise for the combat system. Hearkening back to Spell Making, as seen in The Elder Scrolls III: Morrowind and The Elder Scrolls IV: Oblivion, the system proved to be heavily customisable and granted further freedom of choice for the player. Over the past four years, there have only really been two data mines that come to mind; one by dominoid73 on the /r/elderscrollsonline subreddit, and another by the UESP on our Twitter channel in early February of last year. Furthermore, the official @TESOnline Twitter handle for ESO responded to a tweet which asked about what the current plans were for Spellcrafting. While we got confirmation that this is something they are still thinking about implementing, it was still responded to in May 2017, and we haven't heard of any developments since then. Talk about Spellcrafting has been quiet, apart from the few theorycrafters who enjoy to dabble in the idea of how the system will work in the current meta. So we would like to reignite interest in a system that some of you may have forgotten about over the past few years! While we have uncovered multiple Spellcrafting assets (which could potentially be the Summerset Chapter's new system), we must admit that these files have been in the game since the last update (Clockwork City), and we don't know exactly how new they are. Regardless, with the addition of the Summerset Isle, the theme seems fitting to implement a Spellcrafting system, which is why we're including it at the foot of this post. The visible files shown in the above screenshot look to be furniture that one could purchase from a special Spellcrafting furnishing vendor. More integration with the Housing system is always good news! This texture file is for the magical doorways which lead to the spell tome rooms that would be scattered across the ruins of Tamriel. One of these magical doorways can even be seen in the QuakeCon 2014 showcase, as seen in the above screenshot. Now for the model assets... This is an example of a Spellcrafting room, where spell tomes can be found at the centre. One of these Spellcrafting rooms can also be seen in the QuakeCon 2014 showcase, as seen in the above screenshot. For those who are interested, this is what the outside of the Spellcrafting room looks like. Despite their names, they do not look anything like the normal Spellcrafting room, instead they seem to take the model of the respective spell (the illusion and frost spell effects, in this case). A gate with two statues on either side of the entrance, this model can be seen in the background of the video (and screenshot) above. A tome stand for Spellcrafting rooms, shown in the centre of the particular room that is featured in the video (and screenshot) above. We also found three miscellaneous Spellcrafting furniture assets (unrelated to the Housing system) that were shown in the Spellcrafting room of the video above, as well as the rune language texture and the rocks that can be seen floating in the centre of the room. There were many more spell animation effects, but these were the most interesting ones. The rest can be seen listed in the folders below. That just about wraps up this post! We expect to have a final part out soon, so please stay tuned! In the meantime, you can chat with us on our Discord server linked here. Thank you so much for the comments and feedback we received from the first post, and we look forward to hearing what you thought of this one!